Getting an error saying that awesome video that you just spent a week making is too big to send to someone? There are several ways to fix this issue. We compiled a list of the most effective, simplest, and most secure approaches to transferring large files. No matter how you decide to send a file, changing the size to make it start will only help it take up less storage. Compressing files is easy. It will make the file smaller and transfer no matter what method you choose – email, cloud storage, or FPT. Most operating systems have file compression software built into them; making the process to create a ZIP file simple. Here’s how it’s done on Windows and Mac operating systems. If you are trying to transfer a multimedia file, like a video or music, you may want to use RAR compression instead of ZIP. RAR will use a better compression algorithm. This will help limit data loss and corruption. There are several free and paid programs that can be used for this conversion. 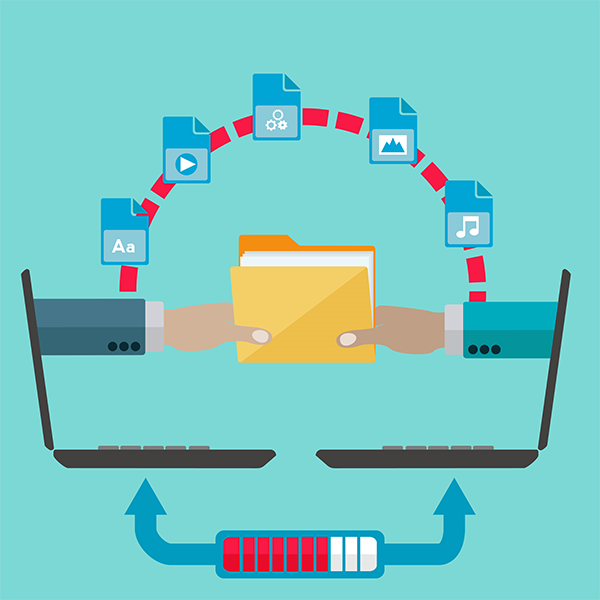 The most popular and most convenient option for transferring large files is using the cloud. The user can upload them to an online storage service, or the cloud, and the recipient can download them. There are several options for cloud services to choose from. Below is a list of popular ones but does not include all the ones available. If you already have a Gmail account, you will have access to Drive. Google Drive offers up to 15GB of free storage. It has a backup and syncing options which make sharing large files a snap. Drive also has a upgrade option for more storage, starting from 100GB for $2.00 per month to 1TB (1,000GB) for $10.00 per month. Dropbox is very similar to Google Drive in terms of features. The basic account comes with 2GB of free space with several sharing options. An advantage to Dropbox is that it is more accessible then drive. It has an app for non-android or iOS devices like the Kindle. A $10.00 per month subscription can get you an additional 1TB (1,000GB) of storage and $20.00 per month will give you other features and sharing controls like the ability to set passwords and create links that will expire after a period. OneDrive is Microsoft’s in-house cloud service. It has done a lot of growing over the years and is one of the best solutions for storing files and folders. OneDrive will allow you to share anything where ever you are and allow you to stop sharing with the ease of clicking your mouse. It comes with 5GB of free storage. A user can get 50GB for $2.00 per month; $7.00 per month will increase you to 1TB (1,000GB) of storage. If you have Office365, you automatically receive 1TB of storage as part of your subscription. If you are a Apple user, the iCloud is a great option. It comes with 5GB of free storage; but also has upgrade packages. 50GB of storage will run $1.00 per month, 200GB for $3.00 per month, 2TB (2,000GB) for $10.00 per month. Any songs, videos, or movies downloaded from iTunes will not be included in your storage limit. However, it is important to mention that automatic iCloud backups can devour your limits quickly. FTP is losing popularity as cloud services gain favor by users. FTP is the best solution if you do not want to compress files before sending them. Using FTP can be a rather lengthy process but it is the most reliable way to transfer large files for free. FTP is also not the most secure way to move data. Popular programs are Cyberduck, Filezilla, or the sFTP extension for Google Chrome.